Downtown Seattle, from the top of the Space Needle, circa 2005 (looking south). Beyond Downtown is the Industrial District. Downtown is the central business district of Seattle, Washington. It is fairly compact compared with other city centers on the West Coast of the United States because of its geographical situation. It is hemmed in on the north and east by hills, on the west by Elliott Bay, and on the south by reclaimed land that was once tidal flats. It is bounded on the north by Denny Way, beyond which are Lower Queen Anne (sometimes known as "Uptown"), Seattle Center, and South Lake Union; on the east by Interstate 5, beyond which is Capitol Hill to the northeast and the Central District to the east; on the south by S Dearborn Street, beyond which is Sodo; and on the west by Elliott Bay, which is part of Puget Sound (an inlet of the Pacific Ocean). 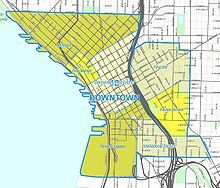 Belltown, Denny Triangle, the retail district, the West Edge, the financial district, the government district, Pioneer Square, Chinatown, Japantown, Little Saigon, and the western flank of First Hill west of Broadway make up downtown Seattle's chief neighborhoods. Near the center of downtown is the Metropolitan Tract which is owned by the University of Washington; prior to 1895 it served as the location of the university's campus. Downtown is Seattle's finance and commercial maritime hub as well as its center of nightlife and shopping. The downtown shopping mall Westlake Center is connected to Seattle Center by way of a monorail. Downtown Seattle's Columbia Center has 76 floors, a greater number than any other building west of the Mississippi River; however there are taller buildings in Texas and California by height. (Smith Tower, in the older section of downtown called Pioneer Square, once held the title of tallest American building west of the Mississippi.) Other notable buildings are the Washington Mutual Tower, Two Union Square, Nordstrom’s flagship store, Benaroya Hall, the Seattle Central Library designed by Rem Koolhaas, and the main building of the Seattle Art Museum (built 1991, expanded 2007), the main facade of which was designed by Robert Venturi. Downtown parks include Westlake Park, Freeway Park, and Victor Steinbrueck Park. The Olympic Sculpture Park was completed on the Belltown waterfront in January 2007. Downtown is also home to the landmark Pike Place Market, the oldest continually operating farmer's market in the United States and the core of activity in the area. After abandoning 'New York Alki', the Denny Party moved across the then named Duwamish Bay in April 1852 to a low level marsh situated with a safe deep water harbor roughly located in the city's Pioneer Square district where they named their new frontier 'Duwamps'. In the late 1850s, present day Downtown Seattle became the main residential outskirts of the city. But after the Great Seattle Fire, the business district was moved here. Because of the fire the city had to be built at a much higher elevation to avoid past drainage problems and regraded some of the city's hills starting somewhere around 1876. Since that time the area had been filled with newly established jobs. Seattle became an industrial hub in 1897 when the Klondike Gold Rush made the city a gateway for discovering gold. Starting in the late 1960s, Downtown has been being filled with dozens of skyscrapers and most famously for changing the Seattle skyline, the Columbia Center in 1985. With about 65,000 now living in Seattle's core neighborhoods (in 2015), Downtown Seattle's population is growing. Downtown saw a 10 percent increase in the number of occupied housing units and an 8 percent increase in population between 2010 and 2014, outpacing growth in the city as a whole. As of the end of 2014, there were 32 apartment and 2 condominium projects under construction, representing over 5,000 units. In 1989, building heights in Downtown and adjoining Seattle suburbs were tightly restricted following a voter initiative. These restrictions were dramatically loosened in 2006, leading to the increase in Downtown high-rise construction. This policy change has divided commentators between those who support the increased density and those who criticize it as "Manhattanization." As of 2018[update], Downtown Seattle has 82,000 residents and 300,000 jobs, including 48,000 added since 2010 in the Denny Triangle area. The downtown area has 71 million square feet (6,600,000 m2) of office space, representing 79 percent of citywide inventory and 55 percent of commercial properties in the city. Office construction continues to grow in Downtown Seattle, with 6.4 million square feet (590,000 m2) planned to open in 2019, along with 161 projects. Downtown Seattle is the largest employment center in the Puget Sound region, with an estimated employee population of 243,995 in 2013, accounting for half of the city's jobs and 21 percent of King County jobs. Several Fortune 500 companies headquartered in Downtown Seattle include Amazon.com, Starbucks, Nordstrom, and Expeditors International. The United States Postal Service operates the Seattle Main Post Office (also known as the Midtown Post Office) at 301 Union Street at Third Avenue. Seattle City Hall is located at 600 4th Ave, adjacent from the King County Courthouse. Downtown is serviced by the Downtown Seattle Transit Tunnel, which carries Link light rail trains between Westlake and Chinatown–International District. The terminus for the Seattle Center Monorail is located at Westlake Center. A large number of bus lines also run through, with the ones operated by Metro previously being free of charge while in the now defunct Ride Free Area; other buses from the suburbs operated by Sound Transit Express and Community Transit also terminate in downtown. ^ Walt Crowley (August 31, 1998). "Seattle: A Brief History of Its Founding". HistoryLink. Retrieved March 27, 2018. ^ Seattle Architecture: A Walking Guide To Downtown 2007, p. 61. ^ Greg Langer (January 16, 1999). "Seattle's Great Fire". HistoryLink. Retrieved June 20, 2006. ^ Seattle Architecture: A Walking Guide To Downtown Seattle 2007, p. 115. ^ "Brief History of Seattle - CityArchives". City of Seattle. Retrieved February 22, 2016. 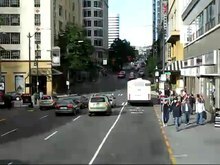 ^ "The Mark _ in Seattle on Vimeo". Daniels Real Estate. May 29, 2013. Retrieved February 22, 2016 – via Vimeo. ^ "State of Downtown Economic Profile". Downtown Seattle Association. Retrieved February 22, 2016. ^ "Development and Construction Projects in Downtown Seattle". Downtown Seattle Association. Retrieved February 22, 2016. ^ Berger, Knute (October 9, 2006). "The Manhattan Project". Seattle Weekly. Retrieved February 21, 2016. ^ Smith, Rob (April 2019). "Statshot: Up With Downtown". Seattle Business Magazine. p. 13. Retrieved April 10, 2019. ^ COnroy, Bill (April 10, 2019). "Office Development in Seattle Kicks Into High Gear in 2019". Seattle Business Magazine. Retrieved April 10, 2019. ^ Smith, Rob (April 2019). "Lack of Affordable Housing, Homelessness, Threaten Downtown Seattle". Seattle Business Magazine. p. 12. Retrieved April 10, 2019. ^ "2015 State of Downtown Economic Report" (PDF). Downtown Seattle Association. Retrieved September 1, 2016. ^ "King County Economy". Economic Development Council of Seattle & King County. Retrieved September 1, 2016. ^ "Post Office Location - MIDTOWN." United States Postal Service. Retrieved on May 5, 2009. ^ Davila, Florangela. "Clock Is Ticking On Filing Tax Returns." The Seattle Times. April 15, 1998. Retrieved on May 5, 2009. ^ "Appeal of CARL A. CURRIER, JAMES KERNS, DAVID BAR - P.S. Docket No. POB 00-209, P.S. Docket No. POB 00-271, P.S. Docket No. POB 00-272 Archived September 4, 2006, at the Wayback Machine." United States Postal Service. Retrieved on May 5, 2009. ^ Downtown Seattle Government Buildings (PDF) (Map). City of Seattle. Retrieved February 21, 2016. ^ Downtown Metro Service (PDF) (Map). King County Metro. September 2015. Retrieved February 21, 2016. Wikivoyage has a travel guide for Seattle/Downtown.